Solar energy systems are technological applications used to exploit the power of the sun. Solar systems such as solar thermal or solar photovoltaic PV panels are capable of capturing solar radiation from the sun and convert it to useful energy such as hot water, for heating of spaces or for home use, or direct electricity to be used in place of conventional electrical power. What is of ultimate importance is that solar energy systems can, in this way, reduce our consumption of fossil fuels used in conventional power generation thus help us reduce our impact on the environment – greenhouse emissions into the atmosphere and depletion of natural resources. To better understand how we can use solar energy for home applications we take a look into solar energy systems in general; these can be separated into 3 main categories: Solar Thermal systems, Solar Photovoltaic (PV) systems and Passive Solar applications. With Solar-thermal we mean systems that gather thermal energy from the sun and store it at high temperature, as in hot water. The hot liquid can then be used in various ways, such as hot-water-for-use in buildings or as a heating agent for space heating in buildings or as a heating agent in power generation – e.g. super-heated steam that drives a steam generator. Solar thermal systems make use of the solar absorption properties of dark coloured solar collectors. One example is the solar-water-heater used on roof-tops of many houses for a range of applications depending on the system’s complexity and technological capabilities. These may range from simply providing hot-water supply for use or for supplying hot water to the space-heating-system (heating elements or under floor heater). Solar water heaters are the most popular solar energy systems that are being used by home owners or at industrial level as they are cheap, efficient and extremely easy to use. 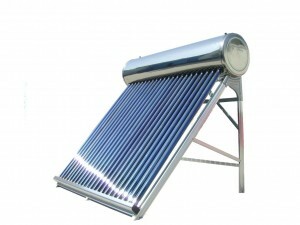 Solar water heaters have become a norm and common practice within the construction industry. Concentrated Solar power (CSP) systems are used with thermal energy storage systems (TES) for the generation of electrical power. 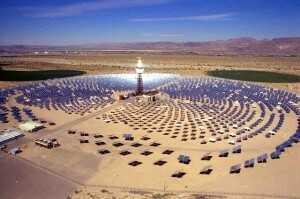 There are several variations of CSP systems such as, Power Towers, parabolic troughs, dish Stirling or concentrated linear Fresnel systems that make use of the same general principle; solar heat is being absorbed and stored in a liquid kept at relatively high temperatures in thermal tanks which is then used to create steam and drive a steam turbine. The turbine revolves to drive a generator which produces electric current. It is important to note that Concentrated Solar Power (CSP) systems come at high investment cost and are generally used for large scale power generation. CSP when combined with Thermal Energy Storage systems can become economically viable though further cost reductions will be required until they become a preferred solution. In general, CSP systems have a promising future in power generation as they may hold a key for increasing penetration of renewable energy sources within the power mix. 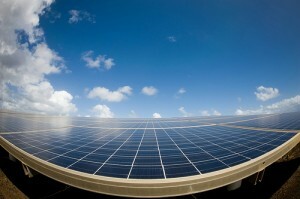 Photovoltaic (PV) systems use solar panels to convert sunlight into electricity. PV panels, through photoelectric process can generate electrons when exposed to sunlight. The photoelectric process uses semi-conductors (e.g. mono or poly-crystalline silicon) to generate electricity. In contrary to solar thermal systems, solar panels do not use solar radiation to generate heat; they directly produce electric current through photo-electricity. Photovoltaic (PV) panels are particularly useful in remote areas for generating electricity for own consumption. – e.g. in remote locations for farms, factories or country-houses or even for powering boats or other equipment (see solar panels for home). In addition they can be easily used for domestic small scale applications to generate electricity in communities and distribute it on the power network – selling it to electricity authorities or for larger scale applications for power generation – selling electricity to electricity authorities under FITS (Feed In Tariffs schemes). Associated investment costs for Photovoltaic (PV) systems have witnessed a dramatic drop in the last years gearing a tremendous boost to their widespread application. Reduced costs of solar panels together with subsidy programs and financial incentives have helped PV systems become a viable and profitable solution for domestic home owners or utility-scale producers. By ‘Passive Solar Systems’ we define all technological applications, or principles, that exploit solar energy potential from the environment. Buildings incorporating bioclimatic principles are energy efficient buildings that minimise energy losses and use solar energy gains from the environment in a passive way. Some examples of bioclimatic applications make use of the thermal properties of construction materials such as thermal walls, sunlight optimisation design, shading or thermal insulation. 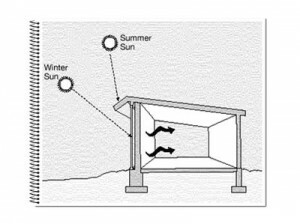 Passive solar systems, as opposed to active systems, do not incorporate any mechanical systems or actively operating components; they aim at exploiting environmental conditions passively as in using thermal materials to store heat and altering the thermal behaviour and energy needs of a building for heating, cooling or even ventilating. Passive solar systems together with active solar systems (PV panels) can play an important role in reducing conventional energy needs, thus reducing our energy bills while saving the environment. Solar energy systems are technology applications that explore the huge energy potential of the sun and use it in place of conventional energy sources – such as fossil fuels (petroleum and gas). Their promising future is based on capitalising important advantages of solar energy systems; exploiting abundant and freely available renewable energy source that can power global energy consumption now and in the future.